I’m starting the new year here in Daylesford, Victoria, Australia, and feeling blessed by that. A few of my friends have posted Facebook posts about good-riddance to 2016. I’m not sure I feel the same, but I am happy to be moving forward with a positive mental attitude about 2017! The new year started with the Table Hill duo (that’s me and my husband) playing music at the Radio Springs Hotel on the 8th of January in the centre of the universe. Lucky me! As I sit and write, in my little house on Table Hill road, I’m listening to my hubby play and sing about sitting on top of the world. That feels pretty good — all of it — the sitting, the blogging, the listening to my hubby, being in the little house on Table Hill road. Table Hill will play again in Lyonville on January 22 @ 12:30 p.m., February 2 @ 6:30 p.m., February 9 @ 6:30 p.m., February 26 @ 12:30 p.m., and March 2 @ 6:30 p.m. Reservations are recommended. The phone number is 03 5348 5562. Come on over, if you can! I am excited about the changes I am making as I move my U.S. residency from Memphis, Tennessee, to Clarksdale, Mississippi! It is a privilege to enjoy dual, international, residencies in the U.S.A. and Australia. The building shown in the picture below is the location of my new home in The Mississippi Delta. 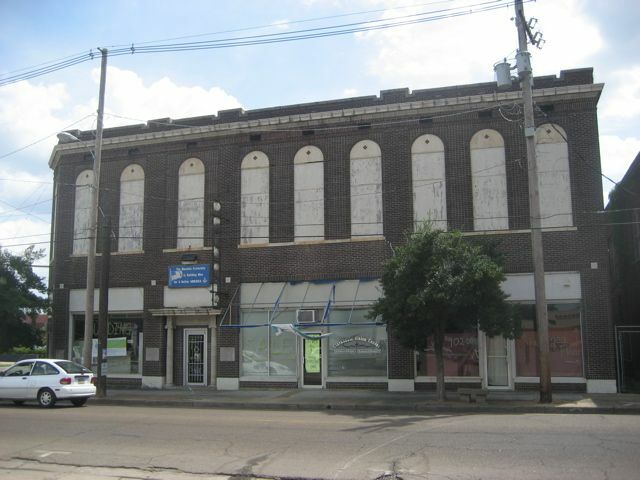 This is an old Masonic Temple building. Adrian Kosky and I are going to be revitalising it with a project that will keep us busy over the next few years. We are hoping to create something like what we have created at Tasma House…..a place for groups to gather together for good reasons. Building the exclusive group accommodation business here in Daylesford, Victoria, Australia, has not been easy, nor by accident, but we have learned a lot along the way. Now we can move forward in another project and bring with us the knowledge we have learned together. Of course, we will also bring dulcimers and other beautiful instruments with us on this journey forward. I’m hoping to combine my Memphis dulcimer sound with the bluesy sounds of The Delta and Daylesford….beginning in December, 2012, and I’ll be blogging about all that at www.TheHolyMoly.com. This is a musical poster that shows the dates Table Hill will play at the Wombat Hill House Cafe in Daylesford, Victoria, Australia. The sound sample is from Table Hill’s first performance at the Wombat Hill House Cafe, September 1, 2012. I’ve just joined an Australian arts forum at http://arts.org.au/forum and now I’m spreading the word about this online community. I’m re-entering the world of WordPress, because I can. It’s been years since I used WordPress. Last time I used this blog system, I was using it for my daughter’s school band and did not have the control I wanted. Now, I’ll see how this one goes.